Host Frank Stasio talks with young adult novelist France O'Roark Dowell about the struggle of fitting in as a teenager. Durham writer Frances O'Roark Dowell tackles the awkwardness of high school in her new young adult novel "Ten Miles Past Normal" (Atheneum/2011). The main character is Janie, a ninth-grader who once thought living on a farm would be great. She proposed the idea to her parents when she was in elementary school, and they embraced it. Now she is an outcast who sometimes goes to school with hay in her hair or goat droppings on her shoes. Davis joins host Frank Stasio to discuss how ministering and storytelling go together and what it's like to grow up in the mountains and retire by the sea. Donald Davis was born and raised in Waynesville, North Carolina. His people go back in Haywood County to the 1700s on both sides. He left home to attend Davidson College and Duke Divinity School. He was a Methodist minister for years before retiring to become a full time storyteller. He now lives on Ocracoke Island and spends most of the year traveling the country visiting festivals and leading workshops in the fine art of oral communication. Davis has committed some of his stories to paper in the new book, "Tales From a Free-Range Childhood" (John F. Blair/2011). McEntire, Miller and Will Hackney join host Frank Stasio to perform live and talk about how love, family and Christianity all play influential roles in their music. Mount Moriah is a Southern folk music band based in Durham, North Carolina. Their self-titled debut CD has rich lyrics that tackle themes such as reconciliation, religious symbolism and gender identity. 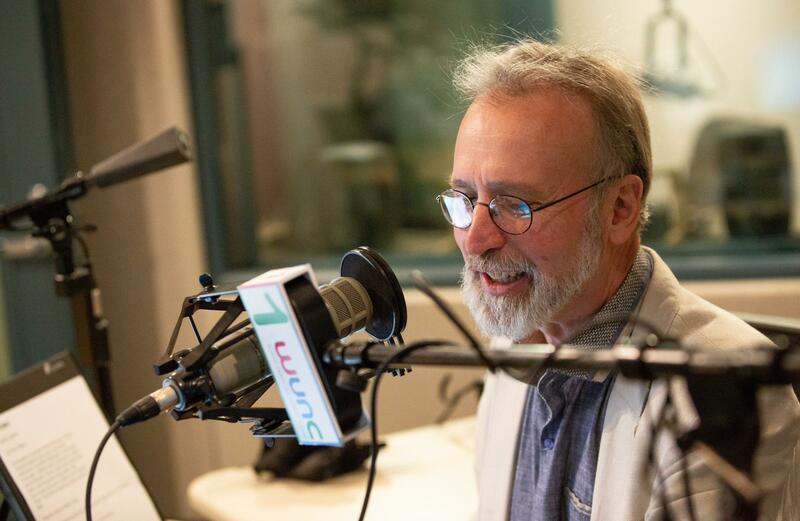 In honor of National Poetry Month, Ruark joins host Frank Stasio to read a selection of poems and talk about why he chose to retire in Raleigh, North Carolina. Raleigh-based poet Gibbons Ruark grew up the son of a United Methodist minister, moving from town to town in eastern North Carolina. He graduated from The University of North Carolina at Chapel Hill and received his master's degree from the University of Massachusetts at Amherst. He taught at The University of North Carolina at Greensboro before settling into a position at the University of Delaware for 37 years, but he never stopped writing about his North Carolina home. His work immortalizes hybrid magnolias and sun lit porches. Ruark is the award-winning author of eight books of poetry, including the most recent, "Staying Blue" (Lost Hill Books/2008). Simon Estes was part of the first generation of African-Americans to break into opera. He's performed for numerous presidents and prominent religious figures, and he's worked with every major international opera company there is. Estes is the guest speaker this Saturday at World Voice Day, sponsored by the Duke Voice Care Center. The audio play "The Witches of Lublin" transports listeners to 18th century Poland. Rivke is the matriarch of a family of female klezmer musicians who get themselves into trouble when the local nobleman, Count Sobieski, demands they play at his son's name day celebration. Klezmer music is traditionally male dominated, and Rivke knows that the Jews of Lublin will consider it a scandal if she plays for the Count. But denying him could have serious consequences. Host Frank Stasio will talk about the radio drama and how it tackles topics like anti-Semitism and misogyny with Sue Zizza, co-producer and director of "The Witches of Lublin"; playwright Ellen Kushner; and playwright and composer Yale Strom. Host Frank Stasio will talk about the radio drama and how it tackles topics like anti-Semitism and misogyny with Sue Zizza, Ellen Kushner, and composer Yale Strom. Host Frank Stasio talks about this explorer, historian, poet, courtier and self-made man with Mark Nicholls. Sir Walter Raleigh never hoisted the English flag on the coast of North Carolina. He did not throw his cloak across a puddle for Queen Elizabeth I. And though he liked to smoke, he did not introduce either tobacco or potatoes to Europe from the New World. Though history has misconstrued much of the story of Sir Walter Raleigh, for whom North Carolina's capital is named, he was a compelling character nonetheless. Host Frank Stasio talks about this explorer, historian, poet, courtier and self-made man with Mark Nicholls, co-author of “Sir Walter Raleigh: Life and Legend" (Continuum International Publishing Group/2011). Deirdre Haj and Sadie Tillery join host Frank Stasio to talk about the festival's economic impact on Durham and which of this year’s films have buzz. Starting today, film-makers and film lovers descend on Durham, North Carolina for the annual Full Frame Documentary Film Festival. Participants can feast their eyes on over 100 films, listen to panel discussions and partake of Durham’s abundant Southern hospitality. Full Frame is one of the only festivals in the world dedicated to nonfiction films. It started in Durham 14 years ago and has grown to international prominence. Deirdre Haj, the festival’s executive director, and Sadie Tillery, director of Full Frame’s programming, join host Frank Stasio in the studio. Host Frank Stasio will talk about efforts in North Carolina to crackdown on undocumented immigrants with Viridiana Martinez and William Gheen. Viridiana Martinez of the N.C. Dream Team recently traveled to Georgia to protest efforts there to block undocumented immigrants from receiving higher education. Martinez was arrested for her efforts and faced deportation, though she ultimately was released and returned to North Carolina. Here, she faces similar efforts to stop undocumented immigrants from attending public colleges and universities. Two bills in the North Carolina House tackle the subject, and one of them also strengthens state enforcement of federal immigration laws. Host Frank Stasio will talk about efforts in North Carolina to crackdown on undocumented immigrants with Viridiana Martinez, co-founder and community organizer for the N.C. Dream Team; and William Gheen, president of Americans for Legal Immigration PAC. Grosz joins host Frank Stasio to share some stories and songs from his impressive career. German-born musician Marty Grosz first picked up the guitar over 70 years ago at the age of eight and hasn’t put it down since. Now he is one of today’s foremost jazz rhythm guitarists and chord soloists. Grosz has enjoyed a long career playing in big bands, trios and as a solo artist. He is also well-known for his comedic storytelling and engaging stage presence. Grosz joins host Frank Stasio to share some stories and songs from his impressive career.